A/N: This one-shot was spur of the moment so here you go. I DO NOT OWN LION KING! "Help! Somebody! Anybody…help…"he said this as he started to sob. The small cub went to lie underneath his father's lifeless leg and close his teary eyes. Before he could grasp what was happening, claws ripped into his tiny body. All he saw was his uncle's face before his vision faded into nothing. "Simba! Get up! You're dreaming! ", Kovu spoke as he shook the unconscious and screaming king gently. Simba's eyes popped open meeting the other male's emerald orbs. Without warning, the red maned lion attacked. "You murderer! Stay away from me!" "Stop! It's Kovu…stop-". Simba cut him off, slashing his throat causing his pleas to be his final words. "SIMBA! DAD! ", came two voices seemingly out of nowhere. Nala and Kiara were standing there with tears streaming down their faces. The great king snapped out of his trauma induced episode then looked at what he had done with shock and disbelief. "No! ", he roared as tears began to form in his eyes. He then ran as fast and far away as possible. "What have I done?! Father please forgive me…". By the time he had stopped running, his tears were gone. "Simba! "came a powerful voice from above. Said lion looked up and saw his father who stared at him with saddened eyes. "Kovu will be ok. Nala and Kiara got him help. You need to go back and see Rafiki because he will help you as well." "I can't face them…face Kovu…". "You need to stop being selfish and go back. He will forgive you, but it will take time.". Mufasa then disappeared into the clouds leaving Simba within his horrible thoughts. The lion then ran to the nearby river and proceeded to jump in. Before he knew it, he awoke beside his father. "Why did you kill yourself? ", Mufasa asked disappointed. "I had to...one day I am going to kill Kovu because of these horrible night terrors. ", Simba spoke solemnly. 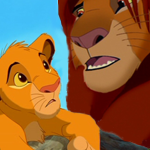 "Son, I realize you were trying to do the right thing, but Rafiki could have helped you. He would have given you healing herbs to stop them." Back at Pride Rock, Kovu awoke in a great deal of pain. He found that he could no longer speak. Kiara then walked into the den and told him that her father died by killing himself. She then nuzzled him crying into his mane. He tried to comfort his love, but he could not utter a word. A few months passed and in that time, Kovu became king. He couldn't speak or even roar, but he was a great ruler who took care of all other royal duties. The lion king had help from the lion guard to protect the lands. Simba and his father looked down on the land with pride. I feel like there's the possibility that psychiatric help needs to be sought if you're writing stories such as this one. I just wanted to say that I know this story was dark, but I figured Simba would have some form of PTSD from the trauma of his father’s death. After all, I have studied mental health in college and I am being treated for one myself. That was a lovely way to start to my morning... ...No offense, but maby Simba and Kovu in the story could have talked about it and had a manly heart to hert?? ?